CU campus in the fall. 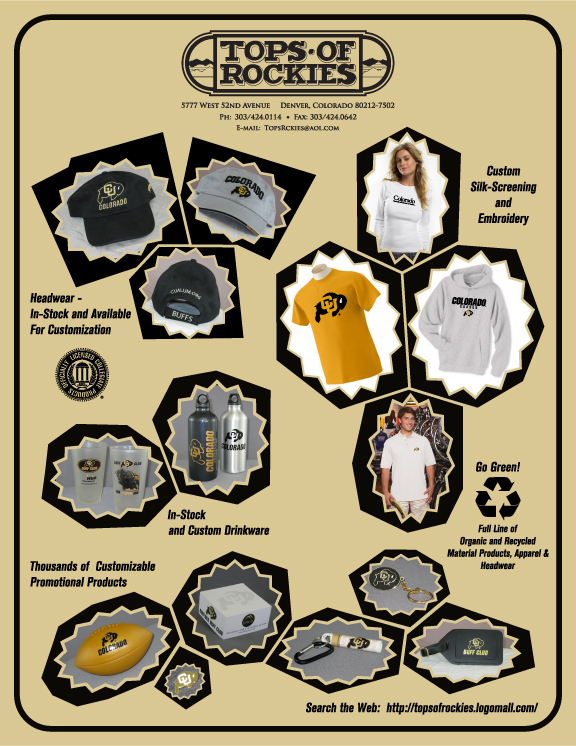 Tops of Rockies has been a licensed University of Colorado supplier for over 20 years. In that time we have serviced the various departments of the university at both the Denver and Boulder campus'. We have learned there are always those immediate needs which can be expensive. We try to keep a fresh selection of head-ware, lanyards, water bottles, glassware and lapel pins in our inventory giving you a great selection of quality products at a reasonable cost. Our in house embroidery department allows us to react to your immediate needs in that area also whether it is a single item or a large order. Our in house art department is able to react quickly to your other special needs whether it be a design for something as simple as a pen or a more complicated T shirt design. We have all of the approved CU logos on file and our experience with the licensing department will guarantee your products conform to their requirements. We have included a small selection of products we often have on hand. Please call with any other questions you may have.